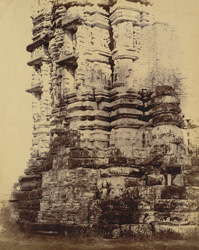 Photograph of the mouldings of the tower of the Bhand Dewal temple, taken by Joseph David Beglar between 1873 and 1874 and described in his 'Report of a tour...in the Central Provinces : "The next temple is known as Bhand dewal, from the naked and indecent figures adorning it outside and enshrined inside. This is a lofty and very graceful temple, although much dilapidated; it faces west...Externally, the temple is richly carved and adorned with a profusion of sculptured statues, many of them highly indecent. The larger figures are in two rows, surmounted by another smaller row of figures, while the whole of the mouldings below is richly sculptured into scrolls, flowers, and processions of horses, animals and men."